1. An overweight, metal-bound, inefficient internal combustion engine that pollutes the very air you breathe? 2. A BMW, the ultimate driving machine? Consumers demand a bit of spin, which is why we think the hue and cry over Dr. Robert Jarvik is off base. Some critics claim that the Pfizer campaign, which pushes the $12.7 billion drug Lipitor, stretches Jarvik’s cred too far: while he did invent the artificial heart, they say he’s not licensed to practice medicine. And he doesn’t row one-man sculls across pristine mountain lakes (seems one spot used a body double). If Pfizer stretched things a wee bit, it’s because consumers need it. People don’t want lies, but they do seek value, and actually require colorful data to make informed choices about the future. A recent study by California Institute of Technology and Stanford found consumers will like wine better if they are told it comes from a $90 bottle vs. a $10 bottle. Play this forward, and you’ll see marketers must make claims if they want to compete among consumers. People chase brands and medical experts because we’re all trying to anticipate pleasure. Like cavemen and women lining up for spring procreation, we size up opportunities based on how good we think they’ll make us feel. Humans probably survived evolution based on information that predicted outcome; ancient mothers said don’t eat the poisonous berries, and our ancestors didn’t. Coloring the story is the only way to capture attention, because our history demands it. A pill that slashes cholesterol by 39% to 60% is nice. But a hip boomer who put a robot in peoples’ chests, soars across mountain lakes, and tosses sticks to a cute dog that may or may not be his — man, now we know we’re gonna feel good. Walt Mossberg and the future of video: Beauty or the beast? We love Walt. But watching the WSJ guru on camera makes us wonder: Why is so much web video still so bad? It looks like Walt forgot to clean his office before this take. We wonder if the emergence of video — yes, real democratized video input will soon be here, with every cell phone inputting images to the web once the U.S. finally gets high-speed mobile figured out like Europe — will threaten old-school writers who, while brilliant, don’t have the anchorman smile of standard TV production. Or maybe viewers will lighten up and learn to enjoy a more gritty world where content, and not beauty, drives communication images. Hmm. Is it the Journal without Wall Street? 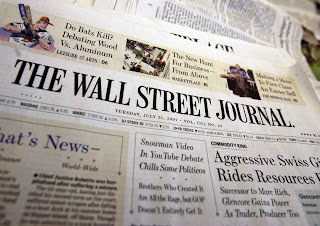 Word is Rupert Murdoch may change the name of the Wall Street Journal to just The Journal. We actually like this. Put aside our brand memories for an instant, and let’s consider the future impact. One: A name change would likely upset some readers, but WSJ’s audience has survived several recent design changes, including color and the new children’s edition small format. The only real screams we heard were when WSJ moved the letters to the editor to a separate section, posting reader responses far, far away from its ice-cold conservative editorial page … and WSJ quickly caved and moved the readers’ voices back. If readers could survive that insult, a name change probably won’t kill existing circulation too much. Two: Now, let’s think about the current readers … baby boomers, wealthy to be sure, but slowly, inexorably headed for that green golf course in the sky. The Journal, er, Wall Street Journal needs to embrace a younger audience. 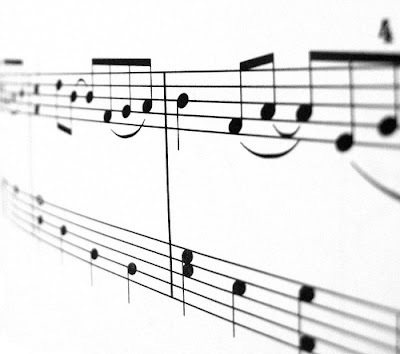 Broadening its brand might help attract new readers. WSJ has already moved far beyond finance into personal technology and feature stories about chefs, cooking, travel and wine. We’re huge fans of WSJ, since it includes some of the best, most thoughtful reporting in the world. Here’s hoping they’re careful with the brand, but with readers bailing out of traditional print, a bold move may be just the thing. NPR gives us hope today that there is something we can do to save the planet from carbon-gloomed warming … eat more chocolate. 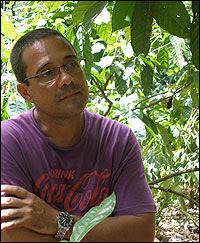 Joao Tavares, the cocoa farmer above, has figured out how to grow chocolate under the canopy of old rain forests, making money while preserving giant trees that absorb carbon emissions. With the U.N. issuing its most dire report on the Earth’s future Saturday, this week will be a case study in how different media and political outlets respond. The NY Times trumpeted the U.N. report in a headline Saturday. WSJ buries the news on A4 today under the obscure headline, “Setting New Carbon Standards,” but with an interesting take on a hard question, who will pay to clean up the planet? WSJ’s editorial board is silent on the issue, which we bet means they’re cranking away to unleash a real humdinger tomorrow. Greenpeace misses the boat, failing to update its web site or press releases and instead gives us old critiques on the whaling industry and Exxon. Al Gore’s Inconvenient Truth blog shows the looming disaster of not keeping a blog current, pitching the DVD with an old post from September 15, 2006. Geez, Al, whatever our politics, aren’t you missing an opportunity here? Whatever. Maybe sea levels really won’t rise 40 feet, because we’re going to eat more chocolate.